In dog training there is no quick fix solution to anything. What appears to be a quick fix undoubtedly comes with any number of undesirable consequences. There are many trainers who will try to tell you that a dog is dominant, or needs to be dominated to be kept in line. 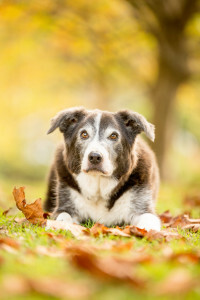 The word “dominant” has been grossly misused in relation to dog behaviour and dog training, and whilst there is a place for it in the context of ascribing a more common trait or preference over another, there is no place for it to describe the overall nature of a particular dog – your dog really isn’t plotting to take over the world! It’s like saying my right hand dominates me simply because I am right-handed. I favour using my right hand however, because that is what has worked for me in the past and it gets me what I want at any particular moment. I use force-free principles to train all my dogs and work on a basis of understanding and shaping behaviour to get the desired result. I also believe that training is 3 parts mechanical skills and 2 parts relationship quality. I work with you to teach you the basics of dog training and will also introduce to you concepts to help you understand what is motivating your dog to do what it does, and offer solutions to help manage that behaviour while training an alternative that is more acceptable. The Day Stay operation is kept small and exclusive. This is so that your dog can enjoy a home environment. 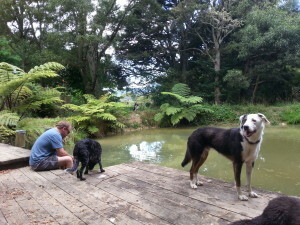 There are paddocks, bush, a pond and a stream to play in and the company of at least 5 other dogs. For rest time there are shady kennels, a cool tiled floor or, in winter a warm log fire. Your dog doesn’t have to be left home alone, he or she will be integrated into my pack and life here and will get to enjoy whatever it is my guys will do. Please note: Because of my own ageing dogs (3 of them) I am not taking any dogs larger than around 25kg,depending on breed or breed mix. I will often choose dogs based on their play style: my dogs seem particularly wary of the dogs that use body slamming as part of play (that’s a fine play style if there are others who also enjoy it) and it isn’t fair on them in their golden years to be slammed about. They enjoy chasing, tug and fetching and if your dog enjoys that, then chances are they will be a good fit. I also have a couple of ongoing injuries to my knee and shoulder and the larger, stronger dogs who haul me sideways when fetching them to and from the van can do me a hurt! I also offer for sale various training tools, toys, healthy treats and dog food. I wouldn’t sell or recommend any of them if I didn’t use them myself. My dog has a really awesome time at the Blue Ash day stay facilities. He always comes home tired and seems to know which day is his play day. It is also comforting to know that my dog can have a great time, but isn’t crowded with a lot of other dogs. There is plenty of room for him to remove himself or rest if he wants to.